The tour includes medical schools; paying homage to Cuban independence hero Jose Marti, and an official visit with President Miguel Diaz-Canel. 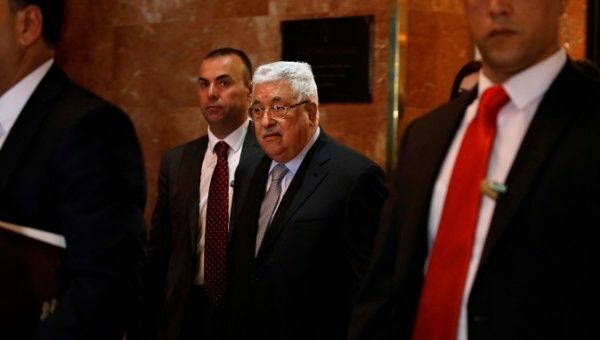 May 11 (teleSUR) Palestine’s President Mahmoud Abbas arrived in Havana, Cuba on Thursday, finishing up the last leg of his tour of Latin America. The visit will include trips to Cuba’s renowned medical schools; paying homage to Cuban independence hero Jose Marti, and an official visit with newly elected Cuban President Miguel Diaz-Canel. Cuba has long showed its solidarity with the Palestinian people, supporting its right to an independent state, and consistently speaking out in the United Nations against Israeli violence. On Wednesday Chile’s President Sebastian Piñera greeted Abbas in Santiago’s Presidential Palace, where he agreed that Palestine must be an independent and sovereign state. The leaders discussed building greater commercial and political cooperation between their nations. Piñera was put in contact by Chilean senator Francisco Chahuan, who led the meeting and organized the luncheon. “Chile was one of the first countries to recognize the Palestinian State. It seems to be great leadership on the part of President Piñera to receive once again President Abbas in La Moneda (the presidential palace),” Chahuan told Radio Cooperativa. Chile has also supported Palestine previously, backing its admission to Unesco in 2011 and its observer status in the United Nations. It was also among the first countries to have official representation before the Palestinian Authority, and recognized the Palestinian State in January of 2011. Chile has one of the largest Palestinian populations in the world, with over 500,000 people of Palestinian descent. Abbas was honored with an Honorary Doctorate from a university in Caracas. The Palestinian leader has asked that Latin American countries not follow U.S. President Donald Trump in moving their embassies to Jerusalem and recognizing it as the capital of Israel rather than Palestine.